This is the second release from BSBC I’ve been exposed to and it is easily up there with my last glowing review of the project. The cassette is simply entitled Witches with the track Witches III on the A side and Whitches IV on the B side. One long track for each side makes for a great goddamn tape here. The enormity of sound and intensity that is Witches III is phenomenal and overpowering. Deep booming rythmic swashes of distorted bass ring like the knell of a death toll. Unholy screaming buried in the mix soon joins in creating a cacophony that sends chills down my spine. This is absolute hate, hopelessness and despair. The track continues with layers colliding and terrorizing eachother, like each one is a starved shell of a being trying to grasp for a dying breath. Witches IV isn’t nearly as effective as side A but does at least provide a solid bed of unbearable noise as well. The track contains a separated background and foreground much reminding me of the style that Hum of The Druid employs. The background is more excellent churning black noise, while I find the foreground to be digitized and grating, taking away from the pitch black atmosphere and making the recording too glitchy for my taste. So side A is a most intense and pummeling affair, while side B is slower and more noise with less character. Not a bad split between the sides but I would have freaked if both sides had the intensity of Witches III. 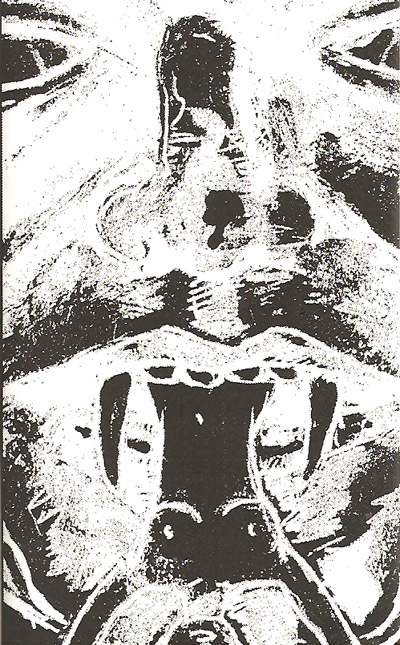 Still makes for a solid tape though, another great release from this interesting Seattle based noise act.